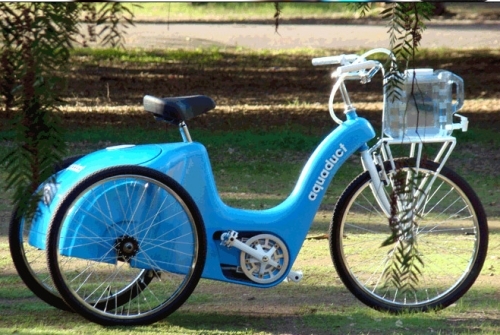 Save Time, Money And The World With The Aquaduct Bike(Trike) | OhGizmo! This unique bicycle won the 2008 Innovate Or Die contest and was created by five IDEO engineers and designers. The Aquaduct allows a person to carry a large amount of water while filtering it into clean drinking water at the same time. Since many villages in third world countries rely on water from distant wells or lakes just getting enough water for a family can take all day. And after the transport is over the water could still be unsanitary to drink. The Aquaduct uses the pedal power to force the water through a filter resulting in clean, ready to drink water by the end of the trip. Eh…seems extremely costly and very difficult to mass produce. people need it (upstairs, classrooms, offices, bathrooms…) The lifestraw does not help to transport water, which is heavy stuff. Who wants to hang out at a polluted lake all day, sipping water through a straw? People have better things to do! Why stagnate by a lake, or walk with filthy water when you can roll, maximize efficiency, be productive, use less energy, and reduce the scarcity of clean water all at once?